It’s not unusual for a child to sneak a radio to bed for joyful purpose of drifting into dreamland with his favorite music under his pillow. For most kids the radio would be tuned to a pop station, programming the hits of the day for his generation. But for a young Chris Owen, the radio was tuned to a public radio station called KLCC, and the music that stirred his soul came not from guitars and pop lyrics, but from synthesizers. The name of the show was New Dreamers. Fifteen years later, Chris is filling the airwaves with his own version of New Dreamers. Hosting the show every Monday night, the audience is treated to electronic music from many different genres. “Electronic music is not a style as much as a way of making music,” says Chris. “It could be rock, punk, new age, classical, jazz, or even country.” He sees it as his mission to give the listeners the full spectrum of electronic music throughout his show. Chris’ New Dreamers includes some regular features, such as a “classical snack” at the end of each show, or a demo song from a new keyboard instrument he has run accross. To showcase local talent, Chris plays compositions from students of LCC’s Electronic Music Program created for their final projects. While listeners are probably drifting to sleep at the end of New Dreamers, Chris is hurrying off to his night job as Master Control Operator (MCO) at television station KLSR.There he spends the night airing and switching between programs and commercials at one of the few manually run TV stations. Following that shift, one might think he might try to get some sleep. But Chris has yet another job. During the school year, he runs the Electronic Music Lab at Lane Community College, prividing resources and scheduling tutoring and studio time for Lane music students. His work at the Music Lab provides precious access to equipment and instruments, sufficiently feeding his electronic music passion You guessed it, Chris is also a musician. 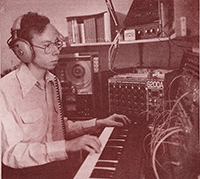 He has played clarinet, trombone, sax, flute, tuba and guitar, but now mostly concentrates on computers, synthesizers and samplers. The music he creates today often stems from his exposure to these instruments, calling upon his unusual awareness of a wide variety of musical styles and musicians. Besides writing and recording his own compositions, he occasionally performs. Chris and his keyboards have gracedthe stage at LCC’s Electronic Artistry concerts for the past several years. Chris’ plans include finnishing his degree in Visual Production, learning post production work for television, and possibly exploring the world of computer graphics. A few hours of shut-eye are scheduled in there somewhere as well. And while Chris is sacrificing sleep to provide electronic music to the KLCC audience, perhaps there is a young teen out there with a radio under his pillow, dreaming of the future.